BANGOR, Maine — Paige Dennison made an emphatic prediction on Vinalhaven’s first day of practice last November. “Paige Dennison was like, ‘we’re going to win the gold ball, Sandy,’” Gilleyanne Davis-Oakes said of the proclamation to Vikings coach Sandy Nelson. Whether by wishful thinking or an acute awareness of her team’s potential, Dennison was proven right on Saturday. Davis-Oakes used her slippery moves in the lane to score a game-high 28 points and grabbed 10 rebounds on Saturday afternoon, leading Vinalhaven to a 55-44 victory over Shead of Eastport in the Class D girls basketball state championship game at the Cross Insurance Center. It is the first basketball state title in school history for the school from the island of approximately 1,200 residents. “I’m just on Cloud 9 right now. 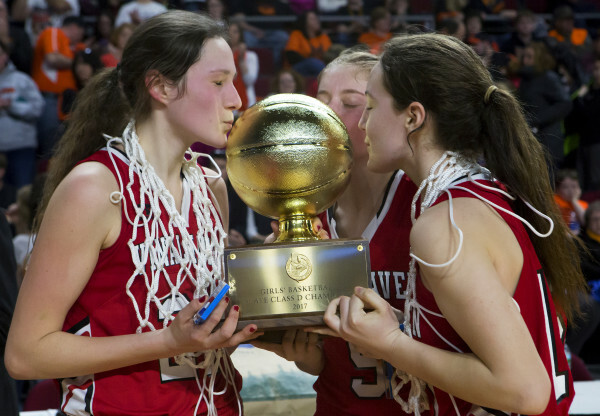 Our whole team, we’re so excited,” said Davis-Oakes as she clutched the gold basketball trophy. “This is the first gold ball we’re bringing back for our school. Our names are going to be in history and we’re going to be remembered,” said Davis-Oakes, a junior who shot 11-for-16 from the field and sank six of seven free-throw attempts while contributing two blocked shots. Davis-Oakes, the beneficiary of excellent passing by her teammates, scored 15 consecutive Vinalhaven points during a seven-minute span of the first half to help the Vikings build a 10-point advantage. Vinalhaven (18-4) funneled its offense through Davis-Oakes early, but demonstrated balance. Deja Doughty contributed six points, five assists and five rebounds, while Dennison (five assists) and Cheyenne Bickford (four rebounds) posted six points apiece. Ashlyn Littlefield added five points, six assists and a steal. All six contributors are juniors. Shead (19-3) made its second straight trip to the state game and didn’t have quite enough to prevail. Senior guard Holly Preston paced the Tigerettes with 22 points and five rebounds. Junior Cassidy Wilder registered a double-double with 11 points and 10 rebounds and also had two steals and two blocked shots. Senior Katelyn Mitchell added seven points and three assists. Vinalhaven took charge with a 9-3 run to start the second quarter. Davis-Oakes opened the spurt with a conventional three-point play off a close-range basket, then answered a 14-footer by Mitchell with a layup in transition. Mitchell came back with a foul shot, but Davis-Oakes scored off a lob pass from Dennison, then made an eight-footer courtesy of a penetrate-and-dish feed from Dennison to give the Vikings a 22-12 advantage with 3:38 left in the half. Shead ended the first half with a 6-0 burst that included two baskets by Preston to make it 24-20, but the Tigerettes never got closer than three points in the second half. Dennison’s 3-pointer 90 seconds into the third quarter restored the Vinalhaven lead to six and the resulting 11-point run, including two buckets by Bickford, made it 37-23. “They were all so focused,” Nelson said.